Australian crochet expert, Jenny King said as soon as she heard about the project she had to get involved. “How amazing will it be to see on tv, the whole of Federation Square covered in poppies, It’s a great way for the community to unite and say thank you to people who have served our country,” Jenny said. Jenny will be hosting a workshop at the Coolum Beach Library on Monday 23rd June at Coolum Beach Library from 10am to 12.00pm. “I want to extend an invite to anyone in the community who would like to get involved with the 5000 Poppies Project, to come along to the informal workshop. “It’s a chance to have a cup of tea and a chat with others who are interested in being involved with the project and learn how to create a poppy using one of my crochet patterns I have designed just for this project,” Jenny said. Coolum Beach Library is participating in the 5000 Poppies Project and asks the community to knit, crochet, felt or sew red poppies (from any materials), the Poppies cannot be more than 15cm in diameter. Jenny said that even if people can’t make it along to her workshop, there are still ways of becoming involved with the project. 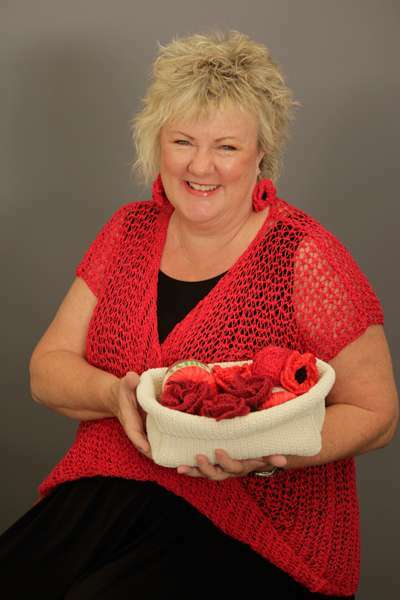 “Anyone interested in making a poppy can head to the Coolum Beach Library, pick up a free ball of wool and a poppy pattern, which they can then knit or crochet a poppy at home,” Jenny said. Free knit and crochet patterns are also available to download at www.5000poppies.wordpress.com. Poppies will be collected and displayed together with their dedications in participating libraries for Remembrance Day 2014, before being submitted to the 5000 poppies team for display in Federation Square in 2015. Jenny, who has been crocheting since being taught two simple stitches when she was just eight, has been passing on her love of crochet since the 1990s and is the author of more than 15 crochet books and countless patterns that cover everything from intricate beaded bags and jewellery to swimwear. Jenny teaches crochet around Australia and internationally including the US and also have a wide range of Crochet Design Books and Patterns – you can check them out at in Jenny’s online shop.